Accidental Locavore at Maison Kayser: Is Anything Better Than Butter? Maison Kayser: Is There Anything Better Than Butter? Butter…does anything smell better than butter cooking? 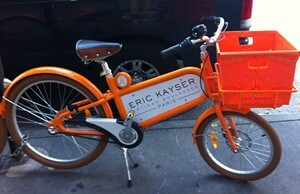 The Accidental Locavore is standing outside Maison Kayser, the new NYC outpost of a famed Parisian bakery. Getting in the mood for lunch there, I was so engrossed in my French tapes that I totally missed my bus stop by two long avenues! Now, I’m standing outside, waiting for my friend to join me for lunch, breathing that wonderful smell of butter — specifically, French butter. Hunger. I’m hoping the crowd will have subsided by the time we get seated, otherwise I may have to duck in and nab a financier or some other goodie to tide me over. And inside they are, of course, French and charming. Eager to seat me even without my friend being here yet (take note of that other NY restaurants!! ), but I’ve decided to stay outside on this lovely day and breath in more deliciousness. So, what was for lunch? And how does the newest contender for croissant excellence in Manhattan measure up? One of the (many) great things about my friend Holly is that she’s always up for sharing food, so we decided to split the croque-monsieur and the fois gras with fig bread — pretty close to a perfect lunch, n’est pas? 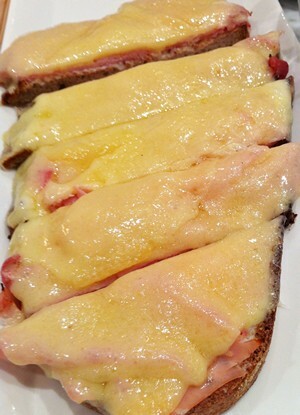 A croque-monsieur is one of the Locavore’s favorite sandwiches when it’s properly prepared. In concept, it’s not difficult, a grilled cheese with ham and béchamel sauce, but like a lot of simple things, every element plays a major part. This one, while delicious with a good balance of ham, cheese and béchamel, was not technically a sandwich, as you can see from the photo, lacking a second piece of bread. 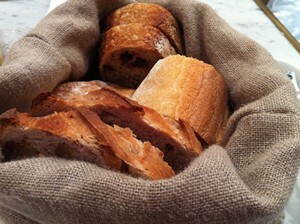 And since Maison Kayser is a bakery first and all the bread we ate was terrific, a second slice of bread would have been welcomed. The fois gras with fig bread was exactly that: two healthy slabs of fois gras with two matching slices of toasted fig bread. Fig jam was there to add a sweet note if you wanted. In small doses it was a nice complement. 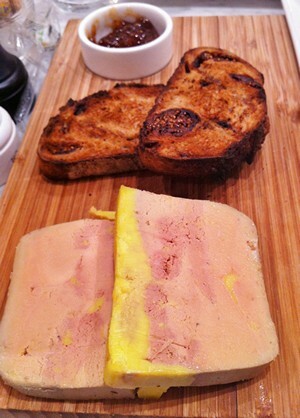 If there is a way to mess up fois gras (other than banning it), I haven’t had it. Truth of the matter, it’s one of those wonderful foods that just makes everything it’s paired with taste better! Of course you’re going to want to know what we had for dessert and you’re going to be disappointed. We had no room left for anything sweet. I guess we’ll just have to go back and see what that side of the menu offers! That would be useful, wouldn’t it? Third Ave between 74 & 75, west side of the street. Let me know what you think.